St. Andrew’s Lutheran Church took over the administration of the Lutheran Food Pantry (previously known as the Lincoln Lutheran Metro Food Parish) in February 2017. It took St. Andrew’s approximately eight weeks to get The Pantry working efficiently. It is now functioning very well thanks to the support of the Lutheran churches in and around Lincoln and the many valuable volunteers who faithfully serve in many ways. Many churches and individuals have been steadfast in donating shelf stable items to keep the Pantry well stocked. We also rely on monetary donations to purchase the items needed to make a well-rounded box of food (and sometimes personal care items) for these needy families. All money donated to the Lutheran Food Pantry is used to buy items we distribute. There are no paid staff members, rent expense, or utility costs. Most of the food purchased comes from the Food Bank of Lincoln. When standard food items are not available from the Food Bank, funds are used to purchase items from local grocery stores. The need for basic items is constant because the Pantry packs boxes for 32 families of various sizes each week that are sent to the City Mission and the Good Neighbor Center. In addition, requests are made each week from the Lutheran churches for emergency boxes for families that contact them when they have an urgent need for food. 1,326 boxes were packed from February through December 31, 2017, giving 4,276 people food to help them in their time of need. As you can see from the information above, we are hoping the Lutheran churches will continue to support the Lutheran Food Pantry by giving an annual allotment donation for each confirmed member. And, of course, we are hoping the monthly contributions of food and miscellaneous monetary donations will also continue in 2018. 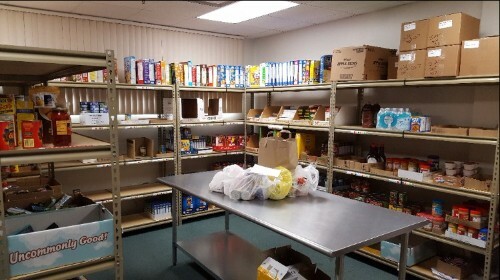 Because of limited funds available when St. Andrew’s took over the coordination of the program, the Lutheran Food Pantry had to cut back on the items purchased for the boxes. With continued generosity of monetary and food donations in the coming year as in 2017, it will then be possible to increase the amount of protein, vegetable and fruit items to the original amounts packed before taking over the Pantry. To keep the Pantry running efficiently takes lots of food and help! St. Andrew’s is blessed to host and coordinate the Lutheran Food Pantry and have it be a part of our mission of “Reaching Out . . . Sharing Grace.” If you have questions about the Lutheran Food Pantry or want to know more about volunteering or donating money and/or items, please contact Tom or Lynn Ochsner (402-466-3893 or lynnfochsner@icloud.com). Your financial support, donations, and prayers are greatly appreciated and are needed to continue this ministry of helping the food insecure in our community.